Every day at school my preschool daughter picks out a library book from the IMC to bring home. On Monday she picked out Curious George Goes to the Hospital . I thought it a rather odd choice but read it to her anyway on Monday night. The next morning my husband woke up and went to feed and care for our cats. He noticed that Katy Bear looked sick and put some food in her bowl. She tried to walk, but couldn't. After consulting with the vet on the phone, we learned that her symptoms were consistent with a stroke and she probably wouldn't live. Before taking her into the veterinary office we talked with our daughter and told her that Katy was very sick and that she might not survive. With heavy hearts we had time to say some quick goodbyes. The vet put Katy to sleep. As soon as my husband left for the vet's office, my daughter went to retrieve the Curious George book. She really wanted to understand what was happening to our cat, and I couldn't help but wish that Katy Bear would return just as Curious George had from the hospital. Sometimes books are good at explaining difficult topics but I don't own any that help explain the loss of a beloved pet. My husband and I adopted Katy 10 years ago, when she was just a kitten. We'll miss our mouse catcher. We'll miss our apple peel eating cat. We'll miss her shoe loving ways. We'll miss her. All new Winnie the Pooh book releases soon! Read the first chapter. A sequel to Winnie-the-Pooh and The House At Pooh Corner is set to be released on October 5th, 2009. 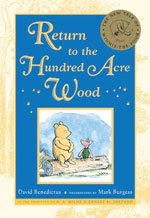 The book called Return to the Hundred Acre Wood written by David Benedictus will be the first authorized sequel ever to be published since Winnie the Pooh arrived on the scene 80 years ago. The book is illustrated by Mark Burgess. The first chapter is available for online viewing in full color. "Rumour" has it that Christopher Robin is the one who returns to the Hundred Acre Woods. From the preview it looks like the book contains a few Pooh-ish touches and a splendid Pooh hum. There's also a YouTube video featuring the well-known narrator Jim Dale reading the Exposition, perfectly setting the stage for this exciting new release. I'm a longtime Pooh fan and own copies of A. A. Milne's books. I'm excited to read about Pooh's newest adventures and see how they compare to the beloved tales. What are your thoughts about this new book? signed 5" x 7" print of "Ruler of the Wild Things"
Find the cow! Pictureka! You'd think growing up in America's Dairyland we'd be able to spot a cow within seconds. 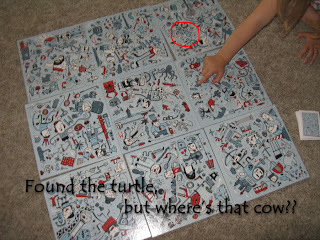 But that little, crazy cow in the Hasbro board game Pictureka! had us searching and searching. For whatever reason, it took my daughter and I about five minutes before we finally spotted the cow. We had a lot more success finding the other objects. In Pictureka! the goal of the game is to locate objects fast. Those that have a quick eye and a good memory will love playing. It's kind of like an I-Spy cross Memory game with loopy, whimsical pictures. The first person to collect 6 mission cards wins. Recommended for ages 6+. The board consists of 9 double-sided tiles with numerous, sometimes crazy illustrations (like a horse passing gas and a stinky sock.) You arrange the tiles in a 3x3 square. Throughout the game the tiles get switched, flipped, and rotated to make locating objects difficult. Adults and kids will enjoy playing this one! You can even vary the game depending on age. For young kids and preschoolers that aren't able to read, the game can be played using only the picture (blue) cards. That's how I played it with my daughter. She really got into the game, at one point saying, "Come on brain! Let's do it!" I quickly realized that preschoolers are pretty observant. My daughter didn't want to put the game away. Those that are interested in bilingual products will like Pictureka! All the mission cards are written in both English and Spanish. Want to try it out? Have some fun and try playing the Demo Pictureka! Game. 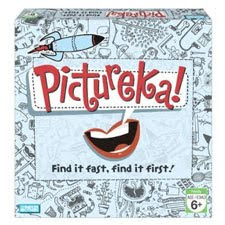 We're planning to play Pictureka again this evening. 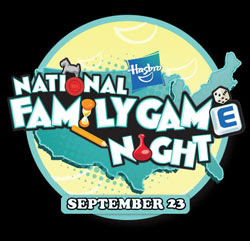 If you hadn't heard, tonight is National Family Game Night. Turn off that TV, gather the family together, exercise those brains and play a few board games! After all, it is TV Turn-off Week! Which games do you like to play with your family? I'm looking for suggestions for preschool games in particular! 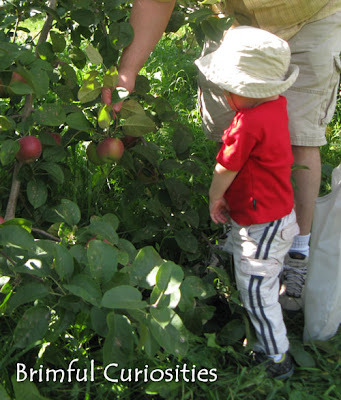 Not so sure about picking apples, but he loves to eat them! During one of the family vacations I took as a child, I visited a plantation in South Carolina. I remember the impressive moss filled trees, the large home, and the tour guides dressed in hoop dresses. As a middle grade student, I was also very aware that part of the history of the home included slavery. Today marks an important day in American history. On September 22, 1862, President Abraham Lincoln signed the preliminary Emancipation Proclamation, thereby alerting the nation of his intention to free slaves within the rebellious states. On January 1, 1863, President Lincoln issued the final Emancipation Proclamation. 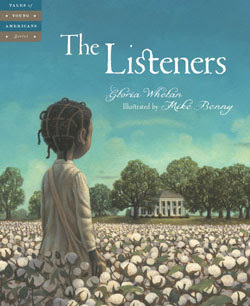 The Listeners, the newest picture book in the Tales of Young Americans Series, depicts the life of Ella May, a fictional slave girl living in 1860, the time right before Abraham Lincoln became president of the United States. Like so many slave children living on a plantation, Ella May helps pick cotton along with her parents. Her friends, too young for the back-breaking work, take care of the animals, watch the smallest children and run errands. But at night they take part in the most important work of all--they hide near the plantation windows and listen for news. They have little control over their own lives, but at least they can listen and report back to their families with news regarding their fate. One spectacular night they hear uplifting news and rejoice at the hope of freedom. Shown through a child's eyes, author Gloria Whelan's portrayal of life on a plantation will help children better understand the history of slavery in America. Her lyrical descriptions are detailed enough to convey the realities of slavery like harsh masters, separation of families and hard labor without becoming overly graphic. Emotion filled illustrations by Mike Benny show the hardships, fear and sadness while also reflecting the joyous occasions of worship, family time spent together and the exciting moments of hope. The gorgeous cover artwork of Ella May in a field surrounded by cotton and glorious blue skies sets a perfect tone for the book. I did not share this title with my preschooler but plan to read it to her in a couple of years when she can more easily comprehend the subject matter. Appropriate for children in elementary school, the book is a good selection for public and elementary school libraries and also would work perfectly as a literature resource for Black History Month studies. The Listeners provides a thought provoking introduction to the journey from slavery to freedom. The election of Abraham Lincoln as President of the United States was a major turning-point in American history and brought on the hope for freedom, equality, and opportunity for all. That hope echoes through the pages of this book. Win a copy! 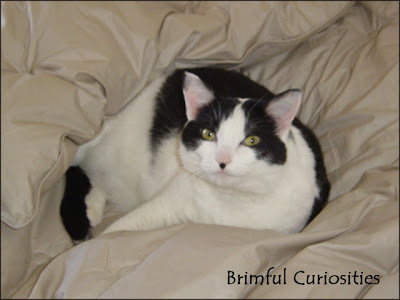 Sleeping Bear Press/Gale Cengage Learning has kindly offered to give away (5) copies of The Listeners to Brimful Curiosities readers. 5 WINNERS! • Contest ends on Monday, October 5th, 2009 at 11:59 PM CST. 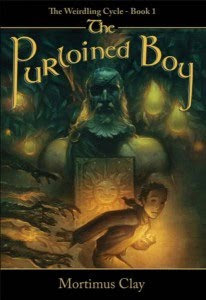 1st extra entry: Visit Sleeping Bear Press and let me know the title of another children's book that you'd like to read. Hard to believe Book Blogger Appreciation Week ends today! I've managed to visit quite a few new blogs and hope to continue to find new ones to follow as I browse through the final posts. Today's topic: Tell us and this is really important, in 50 words or less what you love best about your blog! And then in 50 words or less where you want your blog to be by the next BBAW! Most of all, I love reading and posting about children's books. And, like many of my readers, I'm happy with my Full to the Brim Kid's Book Giveaway Posts (and yes, I'll get around to posting one later today.) If you are a children's book blogger please let me know about your giveaways. By next year I'm hoping to fall into a better routine in posting my reviews. I have more books and products right now in my to-be-reviewed pile than I'd like, so management and balance is a key issue for me. Also, I'm considering a design overhaul. Lastly, I'm toying with the idea of working together with the school system/library and posting a few kid generated reviews. What do you like about my blog? What would you like to see in the future? I value the opinions of my readers and would love to know your thoughts. This weekend, groups of people will gather together at the water's edge and throw pieces of bread into the water. While it might look as if they are feeding the ducks or seagulls, they're not. They're participating in the Rosh Hashanah ceremony of Tashlich, a symbolic practice where they "cast off" the previous year's sins. Beginning at sundown tonight, Friday, Sept. 18, and continuing through Sunday, Jews celebrate Rosh Hashanah, the Jewish New Year. Tashlich is one part of the Rosh Hashanah celebrations. 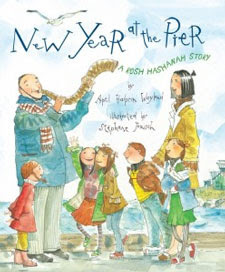 April Halprin Wayland's newest picture book New Year at the Pier: A Rosh Hashanah Story introduces children to the ceremony of Tashlich and teaches about forgiveness and making amends. In preparation for Tashlich, a little boy called Izzy makes an "I'm sorry" list by drawing pictures of four things that he's sorry for doing. On Rosh Hashanah, he sincerely apologizes to his sister, mother and others that he had wronged during the year. He follows members of his synagogue as they all make their way to the pier. After listening to the sound of the shofars, he reflects upon what he has done wrong and throws pieces of bread into the ocean's waters. Stéphane Jorisch successfully captures the solitude of the ceremony, the quiet reflection, and the sense of community in his beautiful watercolor and gouache illustrations. Wayland's text has this wonderful, lilting quality, accurately depicting the uplifting, spiritual aspects of Tashlich. You can tell that Tashlich is her favorite tradition. I admit I didn't know much about Rosh Hashanah before reading this picture book. New Year at the New Pier provides a touching introduction to the Jewish New Year and, in particular, the tradition of Tashlich. Before reading the book, I talked to my preschool daughter about different holidays, and I told her that this book describes a tradition where people take the time to apologize to each other. The important lessons of apology and empathy aren't ones that are easily learned, but Izzy provides an excellent role model for all children, no matter their religion. My daughter's favorite part of the book is where Izzy's mother apologizes to him for always being on the phone. Hmmm...wonder if that is a subtle hint? Izzy has the hardest time apologizing to his best friend, and the actions he takes show children how they can reconcile with their own friends. While my daughter and I appreciate and understand Izzy's story, I imagine that children that have experienced the actual ceremony would especially enjoy reading the book. Teachers and librarians may find the book useful in their discussions about New Year celebrations or religious celebrations. "When my friend Diane lived in Kansas, she put out an old clawfoot bathtub in the yard for the kids in her synagogue class. They wrote what they regretted doing on slips of paper and then walked around the tub singing songs and tossing the pieces of paper into the tub. (She said that they liked this so much, they ran back to write out more "sins" to throw in!)" 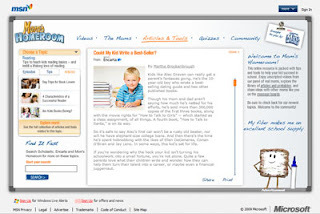 Author April Halprin Wayland regularly contributes to Teaching Authors, a blog where six children's book authors share writing tips, exercises, author interviews and other useful information with aspiring and experienced children's book writers. The Beach Reporter Article - "Local author’s book shows power of new beginnings"
We live in exciting times. Authors, illustrators, reviewers, publishers and readers all get the chance to correspond and interact with each other thanks in part to book blog networks. As a blogger I especially love working directly with children’s book authors and helping them get the word out about their latest books. I met author/illustrator and blogger Elizabeth O. Dulemba through the Yahoo kidlitosphere group. 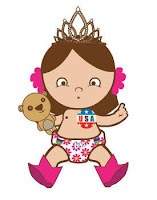 Each Tuesday on her website she posts amazing coloring pages for children to print out and enjoy. My daughter has worn out her markers coloring Dulemba's awesome pictures. If you spend time around kids, you'll want to print out a few for them to color, especially the holiday or book themed pages. 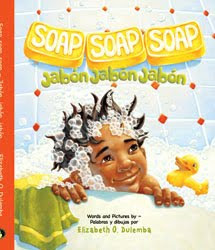 Next week on September 25th, Dulemba releases her picture book titled Soap, Soap, Soap / Jabón, Jabón, Jabón. I'm the first stop on her Blog Tour. Elizabeth, thanks for introducing me to this book and your blog! Those familiar with Appalachian folktales will recognize the storyline of "Soap, Soap, Soap." The Jack Tales story has been retold many times and many versions exist. In Dulemba's updated adaption available in a bilingual format, a boy named Hugo walks to the local grocery store to buy soap for his mother. He takes the long route to the store and travels across a playground, down a sidewalk and by a ditch near his schoolyard. He runs into a number of obstacles along the way, gets mud all over his body and forgets the reason for his journey--the soap, soap, soap! The bilingual edition features Spanish expressions like el dinero, huevos, and ¡Ay caramba! effortlessly sprinkled into the English narrative. A vocabulary page at the end of the book provides an overview of all Spanish terms used. If a muddy romp is your idea of good, clean, picture book fun, you'll enjoy reading Soap, Soap, Soap / Jabón, Jabón, Jabón. The book is available in two different versions: bilingual and all-English. Although we received a galley of the all-English version, I actually prefer the bilingual book mainly because schools and libraries have a need for eye-pleasing bilingual picture books, especially folklore tales. Dulemba's bright illustrations reflect the light, playful tone of the text. My daughter loved the soap graphic underneath each page number and also liked the hilarious picture of a grocer pinching his nose to avoid smelling the stinky Hugo. She really liked tracing the dotted path Hugo takes on his journey to the grocery store, though we did notice the illustration is a bit different from the actual story sequence. Part of the fun of telling the original "Soap" tale is that the boy mindlessly repeats phrases over and over, trying to remember his goal. The repetition is somewhat missing in Dulemba's version, though it is implied. It's wonderful that Dulemba has reintroduced a lesser known folktale to the picture book audience. "As far as SOAP - I've been a fan of Jack Tales for a long time. For my graphic design exit show I created a line of posters for the National Storytelling Festival in Jonesborough, Tennessee. There I heard Ray Hicks (National Treasure) tell Jack Tales first hand. I don't know if I heard him tell it, or somebody else. But I still have the collection of Jack Tales (gathered by Richard Chase) dedicated to me by my Grandparents in 1975. Soap is in a later edition I picked up a while back. So, all said, it's probably been in my life for a long time, even though I can't pinpoint the first time I heard it. And I've heard some wonderful adaptations since as well, although it does seem to be a little lesser known story than say, "Jack and the Beanstalk" (an adaptation of that was the first book I illustrated for Raven Tree Press: Paco and the Giant Chile Plant). Glad I introduced you to something new!" 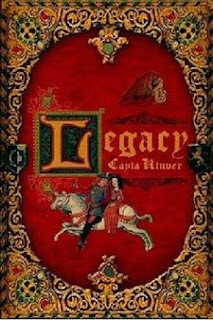 Besides the multicultural element of the book there's a lesson to be learned in this time-tested tale of forgetfulness and mud: Even though you may get side-tracked on your journey, don't forget where you are headed or what you started out to accomplish. That's wise advice for everyone to live by -- children, adults, new graduates, and yes, even bloggers. 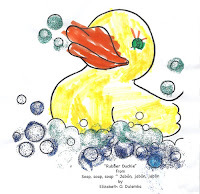 My daughter had a good time coloring the duck from Dulemba's story. Print your own picture at the Soap, Soap, Soap activity page! Index of Appalachian Folktales - "Soap! Soap! Soap!" 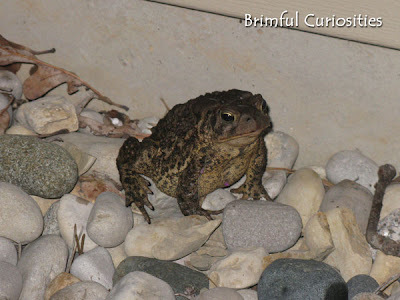 During an evening shower two weeks back we found this toad outside our front door. He/She had better stay away. My daughter's life goal is to become a princess. I'm sure kissing a frog/toad has crossed her mind. 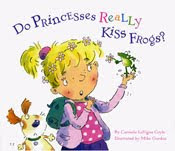 Hopefully reading Do Princesses Really Kiss Frogs? by Carmela LaVigna Coyle has helped clarify the situation. We picked up a copy at the library. Highly recommended for all princesses by nature. Watch out for the hidden dragon! Adorable, clever illustrations by Mike Gordon. I use a pencil sparingly. I hate highlighters. I use bookmarks if I have one handy. Otherwise I use an unused Kleenex tissue. I'm a lucky member of The Literate Housewife's Bookmark It! Club and receive a beautiful new bookmark each month. See a picture of July's bookmark to the right. Before I had kids, I listened to quite a few audiobooks. Unfortunately, they don't enjoy listening to them. I read hard copy now. I always read to the end of the chapter. Once and awhile I cheat and will even read the end of the book before I'm finished. Sometimes that's the only way I'm able to set a book down and go to bed! I'm a juggler - more than one. Mother to small children - I read later in the evening or in the car. We read picture books any time of the day. There's no organization in this house. However, all the picture books are together in the kids' bookshelves. Book Blogger Appreciation Week begins today! Voting is now finished for the 2009 BBAW Awards Shortlists. Although Brimful Curiosities did not make it to the shortlist round, several of my favorite blogs did make the cut. Be sure to check out the list--you might find some great new blogs to follow. I would like to thank all those that nominated this blog in the following categories: Best General Review Blog, Best Kidlit Blog,and Most Extravagant Giveaways. I do appreciate your support and thoughtfulness! Each day this week I'm participating in the BBAW daily blogging topic postings. Today's post centers around this topic: "write a post thanking and spotlighting your favorite blogs that didn’t make the shortlists." For your reference, here's a pretty comprehensive list of Bloggers in Children’s and Young Adult Literature via Kidlitosphere Central. Lots of my favorite blogs on that particular list! Several other wonderful kidlit/YA blogs made the cut in other categories but I'm not going to list them because I'm afraid I'd leave out a few and would feel bad! Congratulations to all the blogs shortlisted. Thanks to BBAW I've found a few new book blogs to follow! How about you? I'm a big fan of Kellogg's Frosted Mini-Wheats. We keep our pantry stocked with the regular, bited size, fiber packed cereal. (I like to buy in bulk!) My son absolutely loves to eat the cereal soaked in a bowl full of milk each morning for breakfast. I checked out the reading and writing resources and found a number of helpful tips and interesting articles. For instance, the article "Could My Kid Write a Bestseller?" talks about famous kids in publishing like Mary Shelley and Christopher Paolini and discusses how the publishing world works. "The Library Card -- a Parent's Best Friend" is an especially appropriate article for the month of September. (September is Library Card Sign-up Month). One article titled "The Rhyming Game" gives instructions on how to create a neat homemade book of rhymes. I'm always looking for new ideas on how to help my children succeed academically. Though I doubt I'll participate in the community portion myself, Mom's Homeroom is a great way to reach out to all those moms looking for additional information and the articles provided on the site are helpful and diverse. The website is updated twice a month and influenced by users' interests. Sorry for posting this later than usual. My kids and husband caught a bad cold or flu last week and they've been under the weather ever since. My blog time has been limited as a result. Hope you have a great weekend!